We went to buy wine and stayed for dinner. 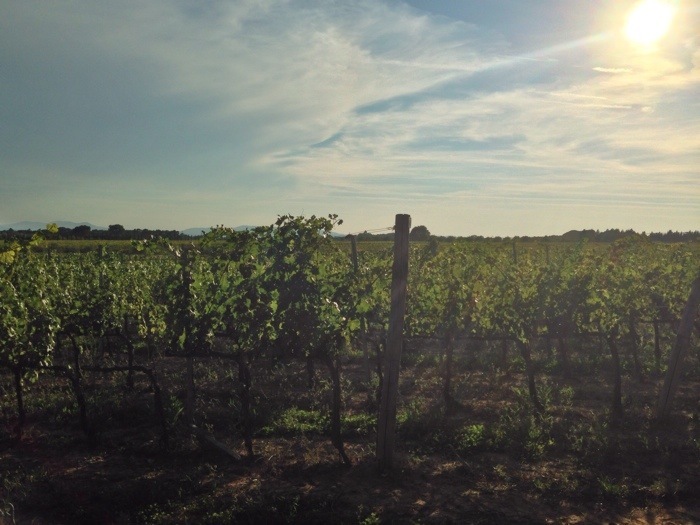 This is the story of a relatively new winery on the Tuscan market, and it just happens to be very close to our country home in Maremma. 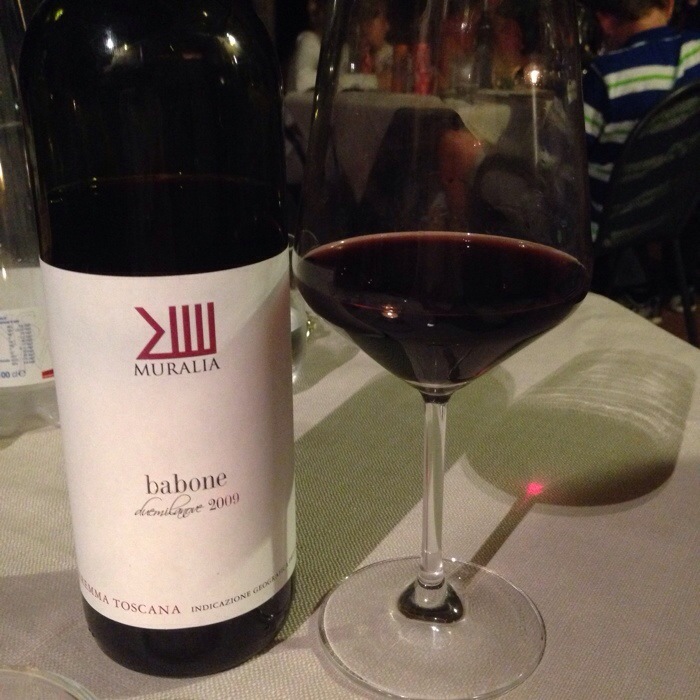 We were familiar with Muralia, a local wine producer, from a good SlowFood restaurant nearby (Oste Scuro in Braccagni). We’d seen a sign for Muralia on the country road we take to get home, and finally today we decided to go check it out. I’ve seen a lot of wineries for a tee totaler. I’ve gotten quite used to the smell, despite not drinking a drop of alcohol of any kind since 1994. Wineries are pretty de-riguer for Tuscany, and I’ve heard a lot of stories about why each produces the best wine, etc etc. Something about Stefano’s story was more authentic than many others I’ve heard. I may not be a judge of wine itself, though I have a sense of what goes into good agriculture, plus I brought along my wine-tasting husband, who approved the product. But don’t trust us, trust the experts – Muralia, in its short life, has already racked up some prestigious accolades from important wine magazines. It’s not easy to leave behind one life and start another, in a different country or simply region. Stefano and Chiaradonata Casali lived and worked in Milan. He had a successful business that grew a lot in the previous years, but he says he felt slave to the foreign multinational upon which he depended. Opportunity arose to get out, providing money to invest in a life that is closer to the earth. Earth is a theme here. We meet Stefano as he is busy at work trying to fix a water problem on his property, that includes an agriturismo as well as the winery and olive oil production. He’s a hands-on kinda guy, not one of those winery owners who comes down from the north, invests money and hires someone to make the wine and someone else to work the land. He’s very literally “personally invested”. Although he has some staff to help him work the earth and carry out some necessary processes in the wine’s fermentation stages, he is the main figure here. 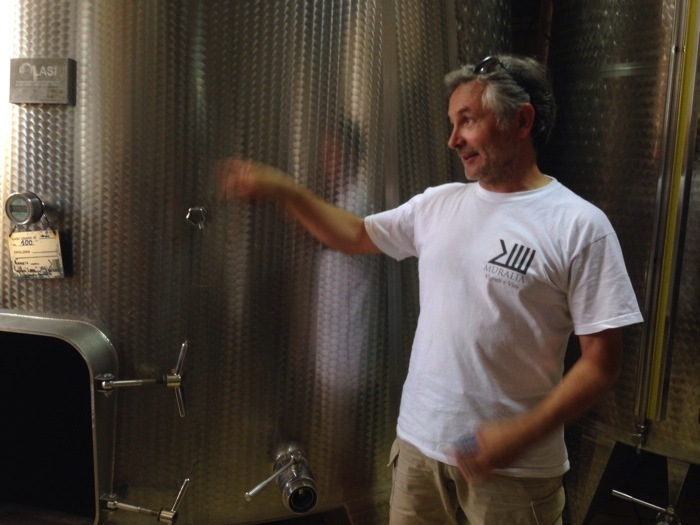 We join an informal tour of the winery with some guests from the agriturismo and someone asks “how did you learn about making wine?” and Stefano’s answer is “from drinking a lot of it!”. Clearly, a lot more has gone into his knowledge, not only of making wine, but also of running a business that has its own complex rules – not the least of which involve following complex and numerous laws for the production of comestibles, and for DOC and DOCG wines. 14 hectares of property, 60,000 bottles of wine for year (with a planned increase to 100,000), 6 types of wine in the catalogue. 80% of his stock is sold abroad, and his limited edition white wine is so in demand it sold out in just one month. Three major prizes have already been awarded to Muralia: a silver medal from Decanter, a gold medal from Mundus Vini, and the Veronelli guide gives it 3*super. Stefano hasn’t done this alone: he knows that he has to work with just the right consultants and image makers. The image makers have done a good job with an interesting challenge – creating a history for a wine producer that has none. Located on a farm road that we often drive along to reach the Maremma town of Sticciano, the closest large town is Roccastrada. 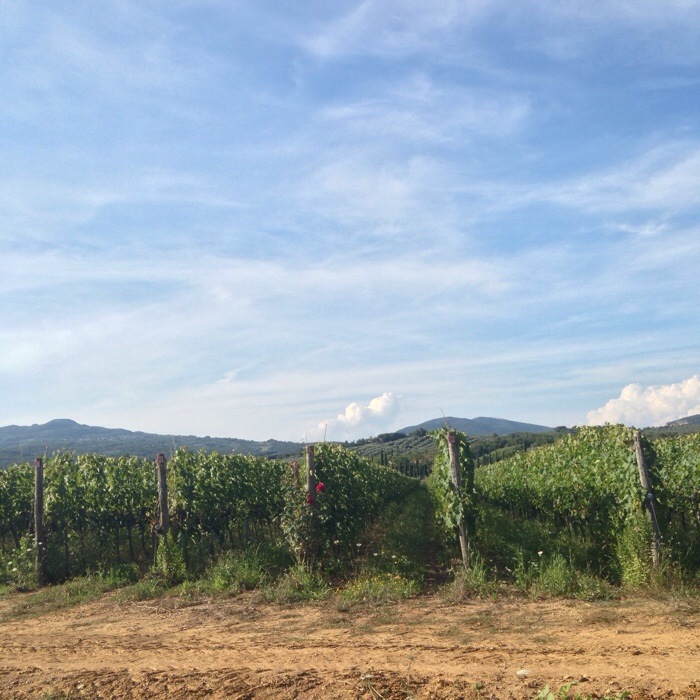 There were already vineyards and a concrete winery on this hidden patch of land of the Lattaia road, but Stefano’s production is of a different level. 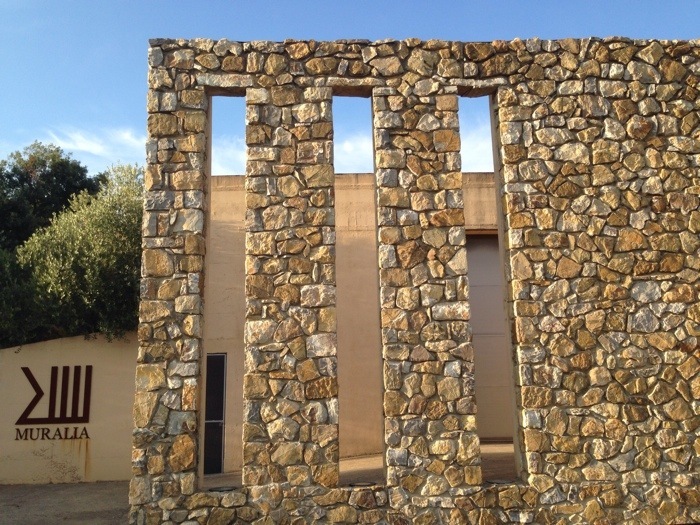 The first challenge, he tells us, was to mask the extremely ugly concrete building on the property, which they did by putting up an attractive modern wall built by a very old stone-mason using stones that were dug up while churning the property’s earth. A testimony to the hard manual labour that goes into wine making. The name and logo refer to the handmade, and are nicely carried through to the modern and minimalist labels on the bottles. But before we get to the bottles, a lot has to be done! Stefano talks about the process that many of us have heard at wineries, and he speaks with frankness about its simplicity. 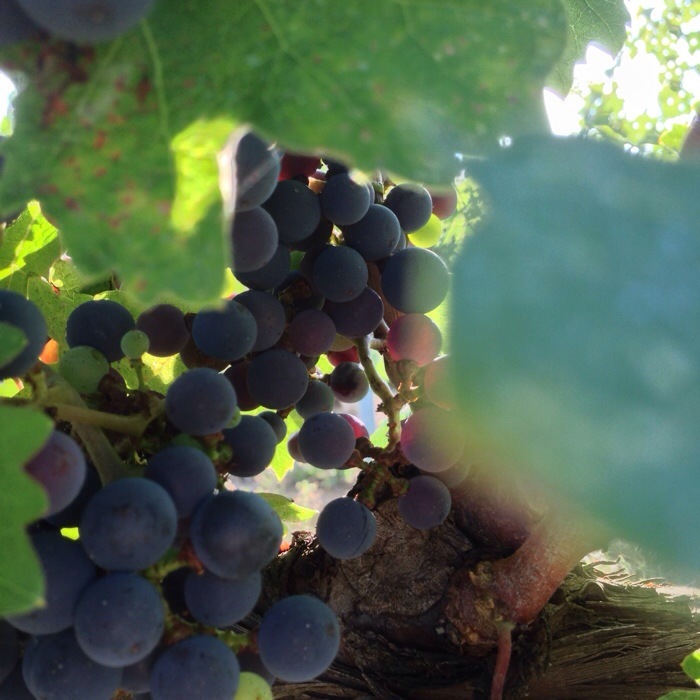 Grow good grapes without pesticides, praying that the weather will be good to you. Hand pick them, the white ones at night, the red ones at dawn, and stay up 24 hours until you finish picking and crushing, immediately and on-site, your harvest. Spend the next few months fermenting it in your large metal vats, a full time job for one man. After that, put it in oak barrels and let time do the work. Of course, there are blends to be made and tested, which Stefano does himself, but he also has a little help from some more expert consultants. The six blends contain for the most part a dominance of Sangiovese grapes (the Altana at 80% with 10% each of Merlo and Cabernet Sauvignon, Babone at 65% with 35% Syrah). There’s a fruity white called Chiaraluna, made of Viognier grapes, that sold out within a month of its production, and that brought us here in the first place (but if you want some you’d better visit in May, and pre-order). A surprisingly fresh rosé called Corbizzo is as versatile as the white, made of 100% Syrah. A fun Manolibera is a different blend each time and an easy table wine, while the top of the line Muralia is a heavier Igt Maremma Toscana Rosso with 50% Syrah, 30% Cabernet Sauvignon and 20% Sangiovese. Stefano says you can drink a whole bottle of his white or rosé and not have a headache the next day, since he does not add any sulfates. We were having so much fun on our tour that we follow Stefano over to his agriturismo, where you can buy wine directly at the cantina (call ahead). 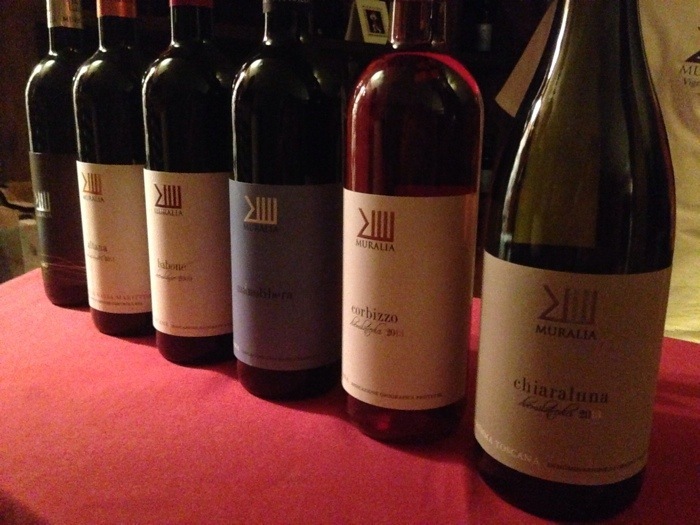 Tommaso picked up 6 bottles, ranging in price from 8 to 20 euro, an excellent price-quality ratio. They’re preparing for the twice-weekly set menu dinner for their guests, and the menu is so appealing that we are happy to learn that they can easily host 2 more people. At 26 euros a head plus wine (12€, same as the bottles we bought) it was not only a pleasant surprise but a very good deal. 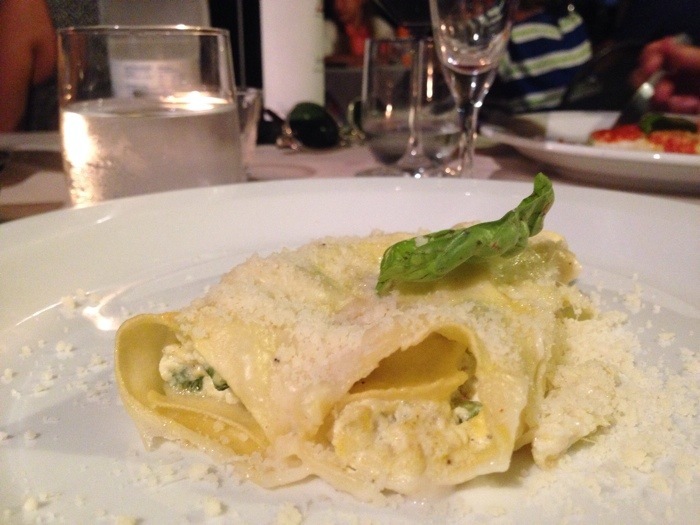 The menu included crespelle with fresh ricotta and zucchini, and arista cooked in their Babone red wine with a side of potatoes, or little sformati of vegetables and salad for the non-meat eater (me), as well as a delicious dessert. Finds like this are the kind of thing that make one’s vacation in Maremma a pleasure – knowing there are still “hidden treasures”, and people happy to guide you through them, be they artistic, or fruits of the earth.